I have to preface the recipe to this cake by telling you that hidden in the directions for this cake is an opportunity to burn the calories you'll take in by eating it. That's right. All you have to do is break your electric mixer, and you're on to calorie-burning heaven. It takes a lot of upper arm stamina to beat egg whites into stiff, foamy peaks by hand, and to beat egg yolks and sugar into a "light cream," so I'm confident that I can now eat at least one extra piece of cake with absolutely no guilt. 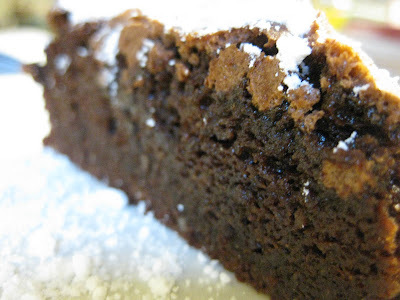 This is a naturally gluten-free recipe for flourless chocolate cake - and it's a much simpler recipe than the one I posted here back in July. Not that that one wasn't heavenly, but if you're looking for a slightly quicker recipe, this might be a better option for you. The process reminded me a lot of the one for the pavlova I made, which was like a big macaroon/meringue, and while this cake was described as being "rich and dense," I found it to be refreshingly lighter that I had imagined. The flavors are not as complex as they are in other chocolate cakes that I've had, but this would still be a good cake to serve to company. It's a nice, solid recipe. It would be even more delicious and elegant-looking with a ganache topping drizzled over the top, or with a caramel or coffee-flavored drizzle. Feel free to improvise! **Update: I made this one again last week, and this time, I lined the bottom of the spring-form pan with sweet cherries and sprinkled them with brown sugar, and then poured the batter over it and baked for about 40 - 50 minutes, until a toothpick came out clean. When it was cooled, I drizzled a dark chocolate ganache and caramelized almond slivers over the top. See additions to recipe below. Preheat oven to 350 F. Spray a springform pan with olive oil or grease with shortening. Brew a small cup of coffee and chop the 6 oz. chocolate. Place them in a bowl together and heat in the microwave for about 1 - 1 1/2 minutes until fully melted. Remove from the microwave and set aside to cool. Separate the eggs into two bowls. Using an electric mixer (if you have one) or a whisk, beat the egg whites until they start to foam. Add the 6 tbsp. sugar in and beat until the egg whites form stiff peaks. Or until your arm feels like it will fall off. Set aside. In another bowl, using an electric mixer, beat the egg yolks with the 2/3 cups sugar until a light and creamy mixture forms. Add the salt and cooled chocolate, and then using a spatula, gently fold the egg whites into the mixture until well-mixed. Fold the almond flour in gently. 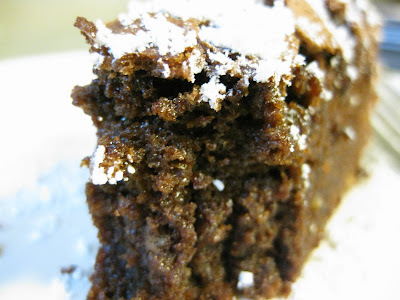 Pour into the pan and bake for 30 - 38 minutes, or until a toothpick inserted into the middle of the cake comes out clean. I had to bake mine for about 38 minutes, and it was perfectly moist inside when it was done. Let cool completely in spring-form pan on a wire rack before removing the sides of the pan. Sprinkle with powdered sugar, or a combination of powdered sugar and cocoa powder, or drizzle with caramel or a ganache topping and caramelized almonds (see below). Chill until ready to serve. Chop the chocolate into small chunks (so it will be easier for it to melt). Heat the soy or hemp milk in the microwave, and when it is hot enough, pour over the chocolate. Stir well, making sure to break up any lumps. Drizzle immediately over the cake and then top with caramelized almonds, if desired. Melt the buttery spread in a pan, then add the brown sugar and mix well. Add the almonds. Cook over medium-low heat, stirring often. The brown sugar and buttery spread will start to get thick and bubble; continue to stir, but be very careful because it will burn quickly at this stage. Continue to heat for 1 - 3 more minutes, then remove from heat and spread out on a sheet of parchment paper or a plate to let cool. Break into smaller pieces once cooled, if desired. Wow, yeah, it doesn't really surprise me that we made the same cake in the same week without talking about it first. We're just THAT COOL. :) Yours sounds like it was so much better, though! The candied almond pieces sound amazing. I thought about making mine a little fancier - I'll have to follow your lead next time! Definitely sounds like a cake that was worthy of your birthday!